Over the weekend I got a box built for the controller and a separate one for the power supply. They are separate because I wanted to be able to move the unit around so it could be in a comfortable location. With the power supply, relay, safelight plugs and the LED drivers it was just too large. So I built a really ugly box out of sheet aluminum for the power supply. And I used a simple project box from Radio Shack to mount the Arduino with the keypad and display in. They are connected by an 8 conductor wire with RJ45 connectors (ethernet jacks and cable). This is nice and flexible, and since there’s very little power drawn by the controller it should be fine over the thin wire. Once I give the box a nice coat of hammered silver finish I’ll post some pictures so you all can laugh at my sheet metal skills. I made my first print tonight using the system. It was a negative I took at lunch when the rain stopped (mostly) for a few minutes. 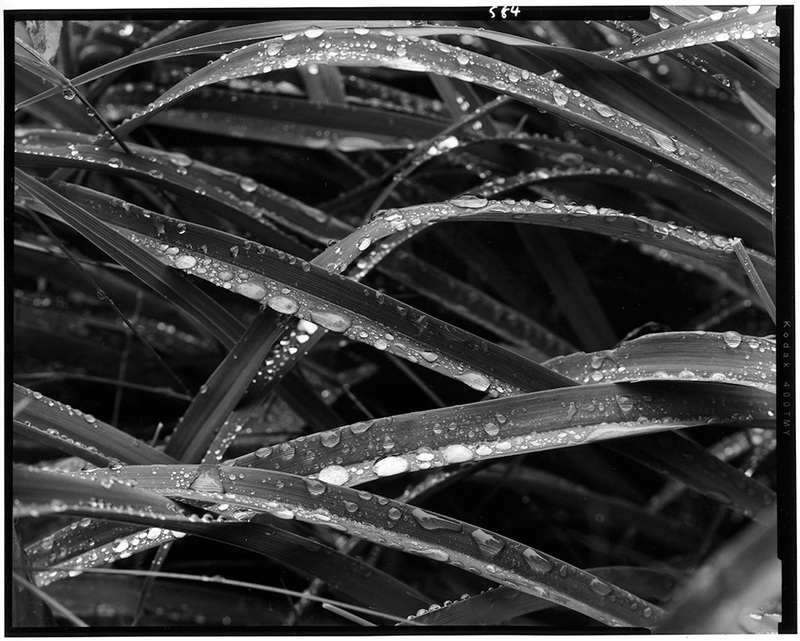 Shot on 4×5 T-Max 400 with a 210mm Macro Sironar and developed in Pyrocat HD in a Jobo Expert Drum. Printed on cheap Adorama RC paper. The print is a straight print at an ISO Exposure Scale of 100 (grade 2). Despite the RC paper it looks really nice. The head is fast as it’s setup. I needed to stop down to f/11 for the print and it was a 6 second exposure. I think this is over a stop faster than the condenser head, but I haven’t measured it. For small prints like this I want to build in a way to dim the lamps some more. That will require some changes to the code. But so far everything worked well, except the test print mode. I screwed something up in that section of the code, and I realized as I went to use it that I had never tested it. So back to the editor it goes. I’ve got a partial metal box made for the power supply and the LED drivers. This will also have relay to control the safe lights, and an additional power outlet that’s on opposite the safe lights. So this could also be used to drive a traditional enlarger. The box isn’t anything to look at right now, but once I make a top it’ll be electrically safe. I’ll post some pictures after it’s a bit more complete. At least it now holds all the parts together which allows me to test the system out. I made some code changes to support calibration of different papers. I started with the idea of calibrating to the traditional paper grades, 00, 0, 1, 2, 3, 4, and 5; but there are really no standards for theses. And since they cover a range of contrasts it made programming the system rather confusing. So I settled on using the ISO system. This is easily measured using a simple densitometer and graph paper. It’s also fully supported by the BTZS Plotter app, which I use for testing. The Variable Contrast Printing Manual by Stephen G. Anchell gives a good overview of how this works. Papers will be eventually read off of an SD card, but for now I’ve been programming a default paper. I could have run a strip at 180, but I never print this low and the Ilford MGIV has a really lumpy curve at this point, so I don’t really plan on using it. 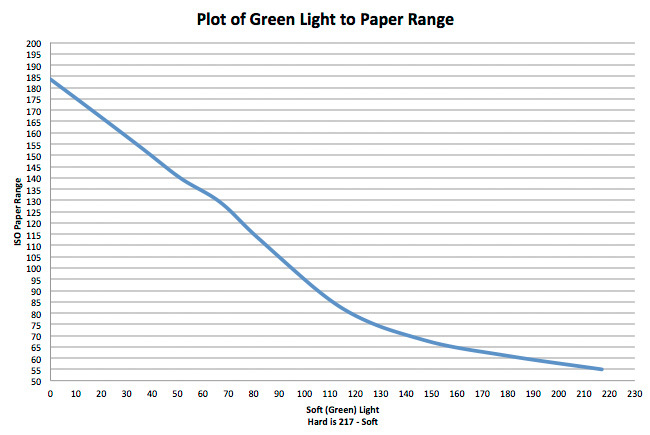 I would reduce my negative or change paper developers before printing with pure green light. 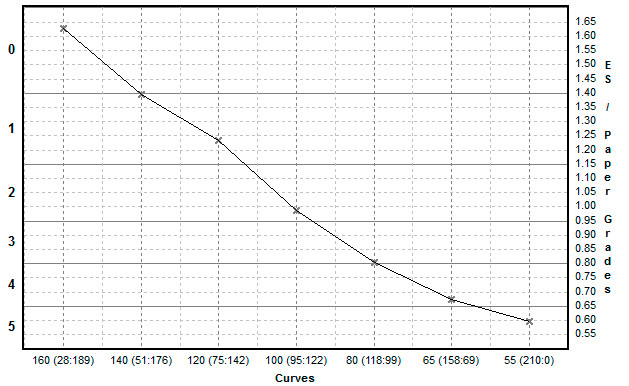 Once these curves were put in BZTS Plotter I got this graph which shows that the system is working pretty well. I could tweak things to make it more linear, but it tracks better than any other head I have used. Now I should know easily how much contrast I will get out of any change, and by reading the negative should be able to zero in on a decent starting contrast easily. Once the system is packaged up I’ll make more accurate curves for each paper I plan to use. That will let me switch papers easily since an ES of 100 should print with the same contrast on both papers (of course there will be visible differences, but the overall contrast should be the same). The chart shows the input grade on the bottom axis, and the calculated grade on the vertical axis in both ISO Exposure Scale and traditional paper grades. Currently I have the system setup to allow changes in 5 ES increments. This seems like a good compromise between precision and keeping the system easy to profile. 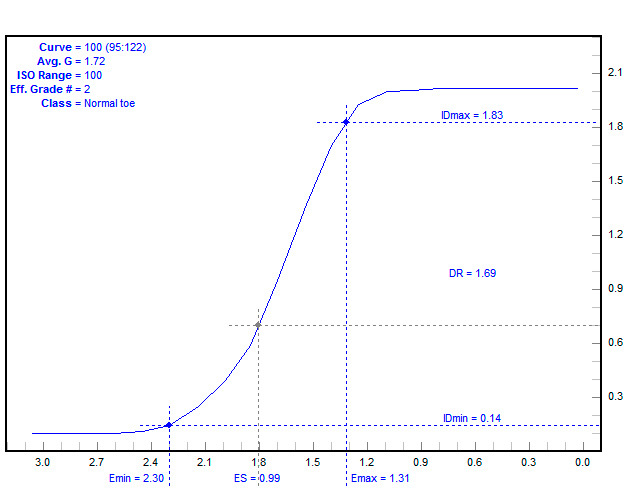 I’m also not sure if a 1 ES change would even be noticeable, or repeatable between exposures. Next I will solder up a prototype board. I’ll test it an then decide if I need any changes before committing to designing and ordering a few printed circuit boards.